BREAKING: BENICIA CITY COUNCIL DENIES VALERO CRUDE BY RAIL! Valero’s dirty and dangerous proposal to bring in Bakken and Tar Sands crude oil on trains from North Dakota and Canada is dead. Benicia City Council, September 20, 2016. Photo by Constance Beutel. Benicia’s City Council vote follows a February unanimous vote of its Planning Commission vote to deny the project. Valero appealed the February decision to the Council, then received a six month delay to request backing from the federal Department of Transportation’s Surface Transportation Board (STB). Earlier on Tuesday, the Surface Transportation Board issued a statement denying Valero’s petition for a declaratory order. 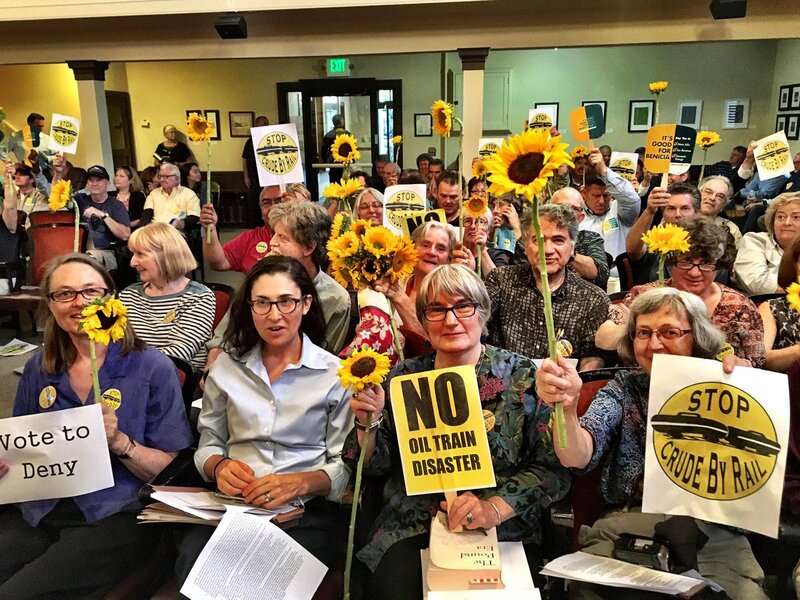 On May 31, Valero submitted a petition asking the STB to rule that the Benicia Planning Commission’s unanimous February 11 decision denying Valero’s oil train proposal is preempted by federal law. Yesterday, the STB denied Valero’s petition for declaratory order.